The Firebird III was on display in the Research Staff lobby for several years. Research Staff was on the opposite end of the lake from Design Staff, and often I’d go inside the lobby to look at it during my frequent lunch time walks around the lake. 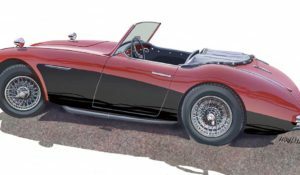 It is an extraordinary car representative of an “anything goes” optimistic age now long gone. The entire brochure text is at the end of the post. According to the text, the Firebird III was ready in case of nuclear attack by the Ruskies (Dr. Strangelove, remember?). GM’s Firebird III at the Desert Proving Grounds, Mesa, Arizona. Photo from GM Styling. GM’s Firebird III posed in front of GM Styling. Research Staff is on the opposite side of the lake. The stunning Firebird IV was the model of restraint as compared to the Firebird III. Photo from GM Styling. This is a story of one experimental car, the Firebird III. 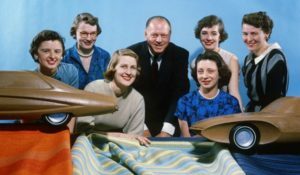 But the imagination that conceived this one car, the engineering and research that put it in motion, and the leadership that combined these skills…these you will find in every General Motors car for 1959. And that idea very simply introduces and explains the purpose of all the Firebird cars that have been built: the Firebird I for high performance, then the Firebird II for futuristic family car design and now the Firebird III that refines the outstanding features of both and adds some startling innovations all its own in the field of human engineering. 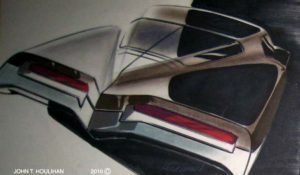 The Firebird III is a joint effort by the General Motors Research Laboratories and the Styling Staff with the cooperation of the Engineering Staff and many participating divisions of General Motors. Don’t be deceived by this Firebird III—it may look like a dream car, but it is a practical workshop for testing advancements that could very well improve your General Motors car of the next few years. 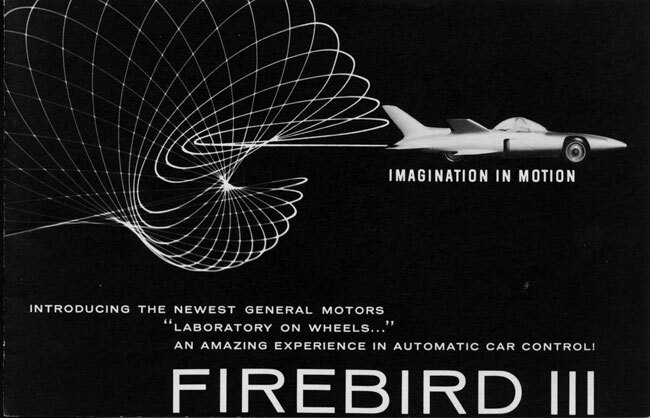 It is this exciting possibility that makes the Firebird III not just a car of the future but an automotive laboratory of today! Automotive engineers have long recognized an area of development known as human engineering. 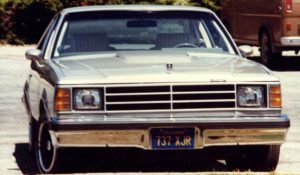 Never has its real potential been exploited, however, as it has in the new General Motors laboratory on wheels, the Firebird III. In this car, the driver has been viewed as a challenge rather than as a limitation to automotive engineering possibilities. Here is an opportunity to use new simplified control devices, to provide improved air-conditioned comfort, and the armchair ride of an entirely new high pressure air-oil hydraulic suspension system. The power roar and hot exhaust from the early Whirlfire GT-302 turbine engine of the Firebird I have been gentled in the more efficient, more compact Whirlfire GT-305 turbine of Firebird III. The automatic guidance principle presented in the Firebird II has now become a reality. At the General Motors Technical Center a test car may be seen any day cruising around a special stretch of road without the driver steering, safely guided by electronic impulses sent from a buried cable and picked up through the guidance receivers on each side of the car. Automatic guidance is only one phase, however, of the electro-hydraulic control system designed for the Firebird III. In this latest Firebird, the driver can handle the car completely through a single control—no steering wheel, no clutch pedal, no brake pedal, no transmission lever. Sounds fantastic? It’s all very real and operational, today, on the new Firebird III! CONTROL for the FIREBIRD III—Imagine the experience of driving the Firebird III. Point the ultrasonic key at the access door, formed by the body panel and forward bubble section, and it gracefully swings upward and forward. Step into the car without stooping and seat yourself in a comfortable individual lunge-chair seat. The position is relaxed, you’ll notice, because there is no steering wheel. That control stick extending just a few inches above the center armrest does your steering when moved from side to side. Yes, and it’s also your accelerator when pushed forward, and your brakes when pulled back. Shifting, too, is easily accomplished by twisting the hand-fitting knob on top of the same control stick. This is Unicontrol—one control does everything! Push a button to start the accessory engine as you and your passenger settle down comfortably. This powers the air-conditioning system to cool or warm the car automatically—even before you enter the car if you preset the timer to put it in operation. It also powers other accessories and the control mechanisms. The main engine is started when you push the ultrasonic key into the receptacle in the instrument panel. Surprisingly, the sound of the gas turbine located behind the passenger compartment is barely more than the whirr of a large fan. Glance at your instruments—there are only three! Just a tachometer, speedometer and fuel gauge. Yes, human engineering says that instrument watching does not go with superhighway driving, so all other instruments signal the driver only as warning lights. Now simply twist the control in your hand to forward drive position and push forward to accelerate. Swinging the control to left and right as you travel slowly, you’ll notice a strong steering response. As your speed increases, this response lessens to prevent swerving and to give smooth, easy steering. Your passenger can share this new driving experience by taking over the control handle at any time. And if you both wish to relax and enjoy the scenery, drive to the nearest highway with the built-in Autoguide beam. Set your automatic road-speed control, the Cruise-control, and then release the manual control. Your car will be steered electronically at the speed you select, regardless of curves or hills. This is automatic car control! As the airplane progressed by necessity from manual to electronic control, so may the automobile. The Firebird III is the first completely electronically controlled car. It was designed and built by automotive men who quite deliberately studied aircraft techniques. They do not intend to take to the air with this vehicle. 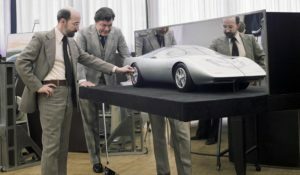 but they do feel that the lifting of previous limitations imposed on automotive design will serve to bring you better cars of the future. The delightful sweeping horizontal and vertical planes of the Firebird III were obviously borrowed form the skyways—their vital function is to provide stability and safety on the superhighways. This is admittedly a test car, imaginative in design, with no pretense of being a family sedan. However, radically improved driver control, safety and comfort features perfected through this vehicle will certainly be advantageous to be enjoyed in family cars to come. We’ve seen that an electronic brain controls the Firebird III—now let’s look at the muscles that make it function. This is a unique dual-power system complementing the gas turbine engine with an important new automotive concept—the accessory engine. The Whirlfire GT-305, a 225-horsepower regenerative gas turbine engine, has been assigned the task of propelling this vehicle. With no other demands made on this engine, all of its energy goes toward driving the wheels and it does this with full efficiency and power to spare. This engine produces power by directing hot compressed gases through a turbine which is connected to the driving wheels, as shown in the large cutaway view. Air enters inlet 1 and is compressed 2 to over three atmospheres. This compressed air absorbs exhaust heat 3 while passing through rotating regenerators, and this heated air enters combustors 4 where nozzles add fuel 5 for combustion. Combustion gases pass through turbine vanes 6 and drive gasifier turbine 7. gases then drive the power turbine 8 (there is no mechanical connection between turbines) and hot exhaust is cooled 9 as it passes through self-cleaning rotating regenerators so that relatively cool exhaust (300 degrees F. -500 degrees F.) is directed out ports 10. Power output shaft is driven by a single stage reduction gear 11 and the engine equipment drive shaft is driven by the gasifier turbine through a set of reduction gears 12. The new GT-305 embodies many inherent advantages. These include high power to weight ration, the ability to use low-grade fuel, elimination of the conventional radiator and cooling system, and inherent smoothness. Also, the mechanically separate power turbine provides a “built-in” torque converter action which produces maximum torque at stall. 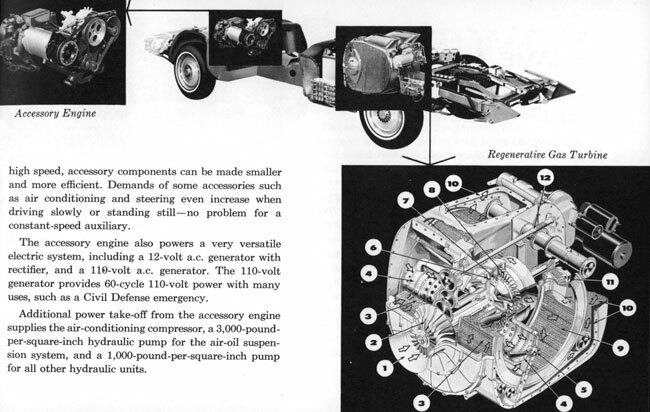 The accessory engine on the Firebird III is a two-cylinder ten-horsepower engine. Made of wear resistant high-silicon aluminum, this accessory plant supplies the electrical and hydraulic power for all the cars control and accessory requirements, whether cruising or parked with the main engine turned off. Because this accessory engine operates at constant high speed, accessory components can be made smaller and more efficient. Demands of some accessories such as air conditioning and steering even increase when driving slowly or standing still—no problem for a constant-speed auxiliary. The accessory engine also powers a very versatile electric system, including a 12-vold a.c. generator with rectifier, and a 110-volt a.c. generator. The 110-volt generator provides 60-cycle 110-volt power with many uses, such as a Civil Defense emergency. Additional power take-off from the accessory engine supplies the air-conditioning compressor, a 3,000-pound-per-square-inch hydraulic pump for the air-oil suspension system, and a 1,000-pound-per-square-inch pump for all other hydraulic units. Central member of the unusual Firebird frame is the giant spine which serves as a housing for the car’s operating control and “nerve system,” the vial electrical and hydraulic lines running through its entire length. Welded to this center spine, the front frame section includes the side rails, cowl and integral front wheelhousings. To the rear of this primary structural member, the frame sweeps out into a housing for the powerful gas turbine engine—actually functioning as part of the air inlet duct to the turbine compressor. The engine silencer is a series of baffle plates within the housing. the rear side rails are an extension of this air intake housing. The frame and all supporting stringers for the body are welded into one unit with provisions for mounting separate Fiberglas body panels. These panels are easily removed for servicing and repair. Th GT-305 gas turbine engine, transmission and differential are coupled together and mounted as one unit behind the passenger compartment. The Firebird III trans-axle includes a Hydra-Matic type transmission mounted directly to the differential case. In this De Dion rear axle arrangement, a short drive shaft with two universal joints is used between each wheel and the differential. The axle drive shafts are mounted to the differential carrier by means of ball and trunnion joints. With this efficient power train arrangement, the usual propeller shaft and universal joints are eliminated. A new suspension system that eliminates uncomfortable pitching motion to provide a softer ride is an outstanding feature of the Firebird III. Through interconnecting air-oil springs on front and rear, any vertical force acting on a front wheel is simultaneously applied to the rear wheel. As a result, pitching motion is suppressed for smooth riding on an even keel. The air-oil unit also has a variable spring constant. In other words, it acts as a strong spring when the car is heavily loaded, as a weak spring when lightly loaded. The car rides just a smoothly, too, when fully loaded as it does when the driver is alone. The new air-oil suspension of the Firebird III uses a 3,000-pound-per-square-inch system powered by the car’s accessory engine. Previous systems operating on lower pressure required larger operating components. These are replaced on the Firebird with compact units, easy to maintain and more efficient in use. Another noteworthy departure on the Firebird III is the use of solid front and rear axles, each suspended on four control arms pivotally mounted on the frame. These solid axles are responsible for excellent stability in cornering since the wheels are maintained perpendicular to the road and afford resistance to skidding. 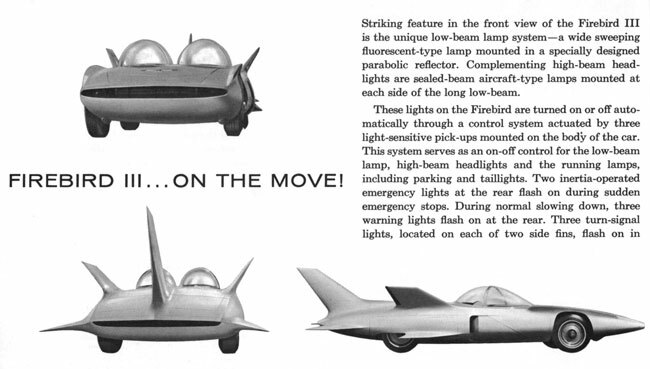 Striking feature in the front view of the Firebird III is the unique low-beam lamp system—a wide sweeping fluorescent-type lamp mounted in a specially designed parabolic reflector. Complementing high-beam headlights are sealed-beam aircraft-type lamps mounted at each side of the long low-beam. These lights on the Firebird are turned on or off automatically through a control system actuated by three light-sensitive pick-ups mounted on the body of the car. This system serves as an on-off control for the low-beam lamp, high-beam headlights and the running lamps, including parking and taillights. Two inertia-operated emergency lights at the rear flash on during sudden emergency stops. During normal slowing down, three warning lights flash on at the rear. Three turn-signal lights, located on each of two side fins, flash on in sequence and remain on to give the impression of a giant arrow indicating the turn direction. The Firebird III on the move is quickly brought to a safe stop by the car’s Turb-Al brakes. In this primary braking system, wheel and brake drum are combined in a single aluminum casting with 36 cooling air passages. Sprayed metal rubbing surfaces on the drums and sintered metal linings provide excellent wear-resistance and positive action even when wet. Additional braking for the Firebird III includes a grade retarder mounted on the rear of the differential. Through a series of friction disks, this retarder provides braking torque on the rear wheel drive shafts. An important safety feature of the braking system is a new anti-skid device that detects unusual traction conditions when the brakes are applied. A sensing element, a sort of “magic box,” automatically evaluates premature wheel slowdown and maintains the proper line pressure to prevent brake lockup. This almost instantaneous action not only prevents skidding, but provides optimum braking capacity and steering control even under emergency stop conditions. Supplementing the Turb-Al brakes and grad retarder are three air brake flaps at the rear of the car. These open automatically in conjunction with the grade retarder on down-hill grades to direct air through its oil coolers, and they also function with the Turb-Al brakes when applied at speeds greater than 30 miles and hour. And now, with brakes released, air brake flaps retracted, and full cruising power applied, the Firebird III rolls swiftly and safely down the test track. It will be studied by engineers of every applied science. It will be torn down, tested, run again and studied more. 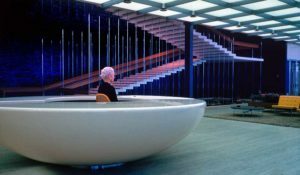 And while all this is going on, there’s a bustle of new activity evident in the Styling, Research and Engineering Staff sections at the General Motors Technical Center. What new projects absorbs the varied skills of all these men? Perhaps they’re beginning the Firebird IV. Imagination in Motion! As a kid, I remember the Firebird III under the lights at the ’59 Motorama, looking otherworldly and untouchable. Decades later, I saw it sitting on the Tech Center lawn at Eyes on Design, just one of many concept cars out there that day. We’ve lost a certain romance that the car represented back in the ’50s. Perhaps it had to happen, but I wish we could get it back.